Publishing pioneering critical editions of great works of Kabbalah. Using state-of-the-art technology to record Kabbalistic texts on CD. Producing scholarly handbooks to address fundamental issues in Kabbalah research. Developing academic courses. Fostering understanding of the Kabbalistic roots in the cohesion of Jewish and Israeli identity. Cultivating a new generation of Kabbalah scholars and educators. The Shlomo Moussaieff Center for Research in Kabbalah, established at Bar-Ilan University in October 2000, is off to a dynamic start, with ambitious plans to introduce a number of projects and activities aimed at advancing research and insight into the Kabbalah in the international scientific community. One of the aims of the Center is to publish pioneering critical editions of great works of Kabbalah which would include original texts (in Hebrew) and their translation into English. 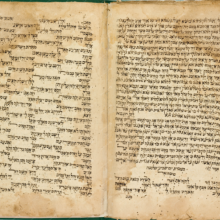 The Center also seeks to compare various manuscript versions of individual texts, in order to create an authorized version of the literature of the Kabbalah. A significant proportion of the literature of the Kabbalah exists only in its original manuscript form, and these valuable manuscripts are dispersed in private and public libraries throughout the world. Much of the scientific research and publications to be produced by the Center will draw upon the rare collection of Kabbalistic manuscripts and large collection of rare printed books which belonged to Shlomo Moussaieff's grandfather and which has been donated by Moussaieff to the University. An essential goal of the Center is to provide insight into the ways in which contemporary culture relates to the traditions of the Kabbalah. To this end, the Center plans to establish a periodical which will offer an in-depth understanding of the Kabbalistic roots in the cohesion of Jewish and Israeli identity, through interdisciplinary research, using the research tools of the humanities, social sciences and the arts. The Center will also produce a series of scholarly handbooks to address fundamental issues in Kabbalah research and present summary reviews of major topics by leading researchers in the field. Until now, no one has undertaken such a project in Kabbalah. The books will be published both in Hebrew and in English. Cooperation in Kabbalah research through international conferences under the auspices of the Center will address the most important contemporary areas of inquiry in the field, and bring prominent world scholars together. Senior scholars will develop curricula which will serve as the basis for courses to be offered to on the undergraduate and graduate levels at Bar-Ilan University. These courses will offer a new generation of students the opportunity to become acquainted with the Kabbalah in an academic context that reflects both serious scholarship and an appreciation for Jewish heritage. The Moussaieff Center will use state-of-the-art technology to record Kabbalistic texts on CDs and develop a computerized catalogue of Kabbalistic literature. Kabbalistic text on CD will enable researchers around the world to locate discussions relevant to the issues they study by using a simple word-search procedure that would cover many Kabbalistic texts simultaneously. A researcher wishing to study the concept of Ein-Sof (Infinity) in Kabbalah, for example, would be able to locate relevant discussions by searching the words Ein-Sof, Ayyin, or Hu, all of which are terms for the Infinite, thus locating the discussions he or she needs in various texts.